Lightly breaded chicken wings. Served in Buffalo sauce with celery, carrots and a side of sauce. Golden deep fried crispy breaded mushrooms. Half shell potatoes topped with bacon, onions, tomatoes and cheese. Our large homestyle breaded chicken breast tenderloins. Our chicken tenders tossed in our special Buffalo sauce. A large basket of our crispy battered onion rings. A collection of our appetizers. 6 breaded mushrooms, 4 Buffalo wings, 4 jalapeño poppers, 3 chicken tenders, 3 cheese sticks and 2 sides of sauce. Lightly battered Mozzarella cheese sticks. Small crispy tacos. Served with nacho cheese sauce. A basket of our golden crispy French fries. Our crispy fresh tortilla chips with homemade salsa. Our crispy fresh tortilla chips with nacho cheese sauce. A large heaping amount of breaded popcorn shrimp. Served with a side of cocktail sauce. Ask your server for todays soups. Add cheese, jalapeños or onions for $0.50. 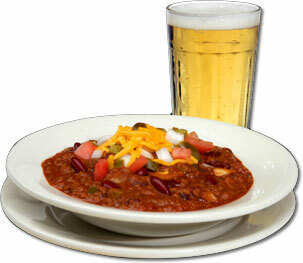 A bowl of homemade soup or chili and a medium garden salad. Choice of dressing. Add chicken breast $3.49. Fresh chopped iceberg lettuce with tomatoes, cucumbers, red onions, shredded cheese and croutons. 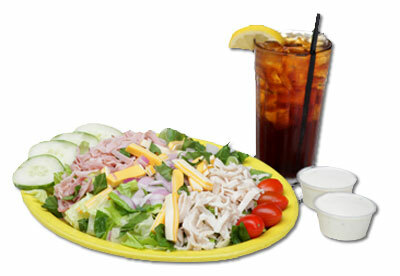 Served with dressing of your choice. Add chicken breast $3.49. Fresh chopped romaine lettuce tossed with Parmesan cheese, croutons and Caesar dressing. Add chicken breast $3.49. Fresh chopped lettuce with tomatoes, cucumbers, red onions, kalamata olives, pepperoncini peppers, beets and crumbled feta. Served with pita bread and Greek dressing. Add chicken breast $3.49. Fresh chopped lettuce with cucumbers, tomatoes, red onions, chopped bacon, blue cheese and dried cherries. Served with Raspberry Vinaigrette. Add chicken breast $3.49. Fresh chopped lettuce with tomatoes, cucumbers, red onions, ham, turkey, American and Swiss cheese and hardboiled eggs. Served with dressing of your choice. Add chicken breast $3.49. We believe in supporting the local economy and buy from local sources here in Michigan. We buy as fresh as possible and cook from scratch right here on our premises. A 12oz. New York Strip steak cooked to perfection. 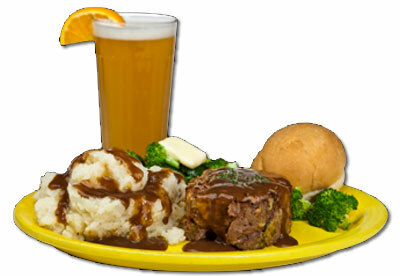 Served with choice of potato, fresh vegetable, dinner roll and a cup of soup or house salad. 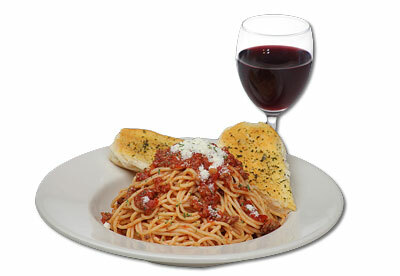 A fresh bed of spaghetti topped with our homemade meat sauce. Served with a breadstick and a cup of soup or house salad. Diced tenderloin steak cooked to order in our house steak sauce. Served with garlic bread. Lasagna noodles layered 4 times with our own extra meat sauce, ricotta, and Mozzarella cheeses. Topped with more Mozzarella cheese and serves with garlic bread and a cup of soup or house salad. Three pieces of hand-dipped beer battered Cod. 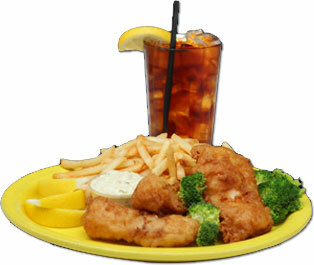 Served with fresh vegetable, French fries, tartar sauce and a cup of soup or house salad. Tender cuts of Prime Rib in a mushroom, onion and sour cream gravy. Served over a bed of fresh egg noodles with a side of garlic bread and a cup of soup or house salad. 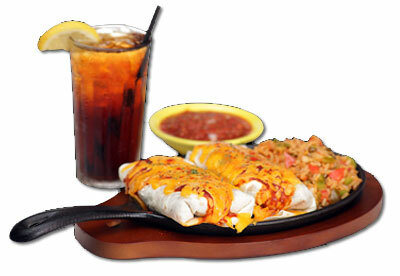 A crispy tortilla shell folded over grilled chicken and shredded cheese. 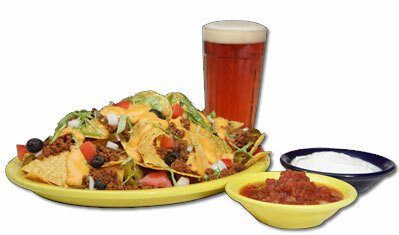 Served with lettuce, tomatoes, a side of Spanish rice, tortilla chips and salsa. A thick slice of of fresh homemade meatloaf with mashed potatoes and gravy. Served with fresh vegetable, dinner roll and a cup of soup or house salad. Spiral macaroni pasta tossed in our homemade 5 cheese sauce. Topped with bread crumbs, a side of garlic bread, a cup of soup or house salad. One burrito filled with seasoned ground beef, cheese and refried beans in a soft tortilla shell with lettuce and tomatoes. Served with Spanish rice, tortilla chips and salsa. Add a second burrito for $2.99. All burgers come with lettuce, tomatoes, pickles, onions and a side of potato chips. Served on a toasted Kaiser bun. Add sautéed onions, mushrooms, cheese or bacon for $0.99. Add French fries for $2.29. Add onion rings for $3.29. Add 1/3 pound patty for $2.79. 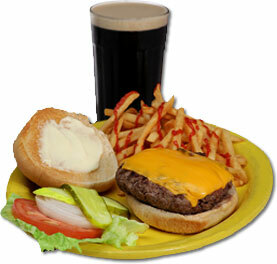 Our hand crafted burger made fresh daily and cooked to order. Our classic burger topped with BBQ sauce, Cheddar cheese and onion rings. Our classic burger topped with sautéed mushrooms and Swiss cheese. Our classic burger topped with Cherrywood smoked bacon and smoked Cheddar cheese on a toasted Kaiser bun. Our classic burger topped with sautéed mushrooms, onions, ham, bacon and Boursin cheese. Our classic burger topped with bacon, cheese, mayo and a fried egg. Hand-dipped beer battered Cod on a toasted Hoagie bun with tartar sauce, lettuce and tomatoes. Shaved smokehouse ham and Swiss cheese on a toasted Hoagie with tartar sauce, lettuce and tomatoes. A breaded chicken breast topped with bacon and Swiss cheese on a bun with lettuce, tomatoes, pickles and onions. A grilled chicken breast on a toasted bun with lettuce, tomatoes, pickle and onions. Three pieces of Sourdough toast layered with sliced ham, turkey, American and Swiss cheese, bacon, lettuce, tomatoes and mayo. Hot shaved roast beef on a toasted Hoagie bun with a side of au jus. Fresh bacon on toasted sourdough bread with lettuce, tomatoes and mayo. A 1/3 pound hand crafted turkey burger on a toasted bun with lettuce, tomatoes, pickles and onions. 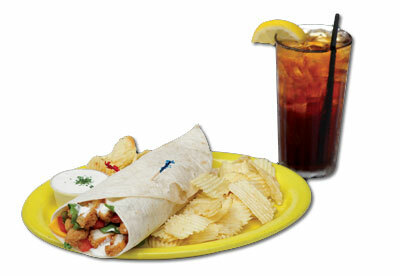 Crispy breaded chicken wrapped in a soft tortilla shell with lettuce, tomatoes, American cheese and Ranch or Buffalo sauce. Shaved roast beef with sautéed peppers, onions and Provolone cheese on a toasted Hoagie bun. Shaved ham and turkey wrapped in a soft tortilla shell with Provolone cheese, lettuce, tomatoes and Italian dressing. A delicate portion of tender flaky grilled Salmon on a toasted Hoagie bun with lettuce and tomatoes. Potato stuffed with onions, bacon and cheese. Tuesday – Sunday, 9:00 a.m. – 12:00 p.m.
A toasted English muffin with 1 egg and a slice of American cheese. A 1/4 lb. burger on a bun with cheese and French fries. 4 chicken wings and French fries. Grilled white bread and American cheese with French fries. 3 large chicken tenders and French fries. A small portion of our homemade cheese sauce and macaroni noodles. A hot dog in a warm bun with French fries. Maxwell House coffee brewed fresh daily. Served with cream and sugar upon request. A large fountain pop. One free refill. Available: Coke, Diet Coke, Mountain Dew, Sprite, Ginger Ale, Lemonade and Iced Tea. A 12oz. glass of iced cold whole milk or orange juice.